Night two of “The Voice” season 7 Live Playoffs had Team Blake open the show. By the end of the night, ‘Voice fans will discover who will be the Top 12 based on America’s votes and judges choices. Blake said about the live shows, “I think the strategy days are over -that’s during the battles and the knockouts.” He said moving forward, all of the members on his team are individuals and special and it’s key to bring that out during the live shows. Pharrell said it’s cool to see all the hard work and intention manifest itself. Gwen said She’s nervous about this night, and she keeps reminding herself that everyone on the show has an incredible platform, and they all got that experience and considers them all lucky. Team Blake was the first one on the chopping block to see which one is the first to be saved. It was Reagan James who was Blake’s first artist to get pushed through. The next artist announced as saved was Craig Wayne Boyd. Blake said they all benefited from the show and it was as if they fast-forward in time because of the advantage that they have now gained. The last artist to get into the Top 12 was picked by Blake – who was Jessie Pitts. 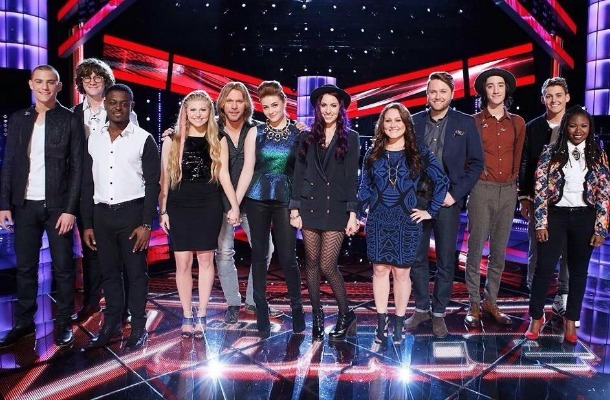 Elyjuh, Danica, Luke Wade, Jean Kelly, Sugar from Team Pharrell performed on The Voice stage. Pharrell said it takes years to find the types of artists on his team. The first artist announced to be saved was Luke Wade. Then, DaNica Shirey was the second artist announced as saved by America. Before he announced who he was going to keep, Pharrell talked to his team. Pharrell said the second part is what to do after the show and told them “this is your moment. This is your time.” He also told them to put out singles. The last artist to make it to the Top 12 was selected by Pharrell. That artist is Sugar Joans. America saved Taylor John Williams. America also saved Anita Antoinette. Ricky Manning, Ryan Sill, and Bryana Salaz were the three artists left out of whom Gwen had to pick one to stay. Gwen told them to “shoot” her an email and stay in contact. She said she is going with the energy that she’s feeling. Gwen picked Ryan Sill. The first artist announced as being saved was Damien! The second artist saved by America’s vote was Matt McAndrew. Next, it was Adam’s turn to pick . Adam told his team “we may not win The Voice, but we have the best team.” He said he’s select does not mean he loves them any less. With only ten seconds left, he picked Chris Jamison.